Back in the 1940's and 50's, arguably when horse racing was at its peak of popularity, the minimum wager was $2 and there really weren't any known issues with that. Using an inflation calculator, a $2 bet in 1947 is equal to a wager of $21.58 today. Down is up and up is down when it comes to horse racing it seems at times. Today, one can make a $1 win bet and a 10 cent superfecta bet (superfectas weren't around back in 1947, but still....). Lotteries in many jurisdictions have been raising their minimums without a loss to their bottom line lately, not decreasing them. Besides the possibility that racing might be selling itself short be feeling it needs dime minimums, keeping minimums so low may actually be hurting the bottom line. They take away much of the incentive from the gambler when it comes to a big score, and also takes away the possibility of carryovers which attracts bigger dollars. If supers had a 50 cent or $1 minimum and lets say that half of the pool or the full pool (after takeout) was to be carried over if nobody had the top four horses in the right order, players would be watching these situations daily like hawks. The same is true for Pick 4's and Pick 5's. Raising the minimum win place show and daily double bet to $5 would more than likely create more value, which would attract more players and would increase the ability of value players to have a chance to make money long term, something horse racing really needs in order to grow. Has any racetrack ever asked their Horseplayers if they'd rather have a 20 or 50 cent minimum or a dollar minimum Pick 4? Has any research been done? Here is an idea, tracks that have two Pick 4 should have different minimums for either Pick 4 and see what happens. When someone says "I hit the super and it paid $569.60" what goes through your mind regarding the payout? Was it $569.60 for a dime? for twenty cents? for 50 cents? for a buck? or for a deuce? Nobody reading this knows for sure and it really shouldn't be that way. Also, there is also an issue that occurs once in a while where the payout might show $28,753.80 (for a two dollar base) but in reality only one person had the whole pool for 50 cents and collected $7,188.45. There is something deceptive about that and it isn't necessary either. To get to the goal of having industry standardized payout prices one must first acknowledge the problem that different tracks have different minimums. There needs to be a sit down of track owners and minimums for each bet type should be agreed to be the same everywhere. That is going to take a while achieve as some jurisdictions need to tinker with state laws, etc, and getting two tracks to agree on minimums is hard enough, asking for all to agree might be more difficult than peace in the middle east. Until that time comes, prices shown should be based on the minimum wager. If tracks like to see higher payouts so they can advertise it, raise the minimum. It looks like Beulah Park created a Frankenstein. Jackpot bets have been put on many a racetrack's wagering menu in the past few years. If they attract lots of action, then it might make sense in some cases, if they don't, they are pretty much useless. They kill churn and they don't attract players to that track unless the jackpot has risen to larger amounts, and even then, in many cases they don't attract enough players to justify their existence. Wouldn't you rather invest in a $1 Pick 4 or Pick 5 carryover than a dime or twenty cent high five jackpot? Has any research been done on what players want when it comes to these bets? Probably not. If a jackpot bet can't attract at least $5,000 in new money a day, it should be banished to the cornfield (replace it with something with true carryover potential like a $1 Pick 5 or even a buck Pick 7). As for the ones that do attract $5k a day or more, why not cap them at $100,000 and when that is reached, pay out all new money (minus takeout) to the multiple winners each day? In the long run this might even end up increasing that racetrack's bottom line. 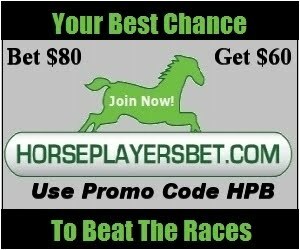 It is probably more attractive to most horseplayers when there is a shot at $100k if you are the lone winner coupled with ability to get your real share of the new money put in if you pick the right five in order. The other solution is to simply stipulate that the racing day after a jackpot pool hits $100,000, it is automatically a mandatory payout day. A mandatory payout with a $100,000 is probably just as good, if not better, than one with an $800,000 carryover, for example, when you take frequency of mandatory pool payouts into account. If you missed the August/September free issue of Horseplayers Monthly, check it out here.